A ‘hot spot’ (also known as pyotraumatic or moist dermatitis) is a common condition whereby an area of skin has become inflamed or infected. 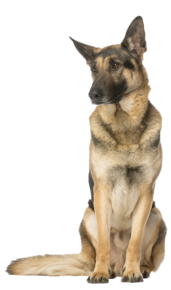 Dogs with a dense undercoat (German Shepherd, Bernese, Labrador, etc.) or matted hair are generally the most likely to develop a hot spot. This dense hair creates a humid and hot environment favorable for bacterial overgrowth. That's also why hot spots are more frequent in summer than in winter. The primary cause is a skin irritation, which can have numerous causes! A vicious cycle of itching and scratching will start. This trauma to the skin barrier's ecosystem can lead to an overgrowth of bacteria on the skin (surface pyoderma), and an infection will then progress. The affected skin patch often appears suddenly as a moist, oozing, reddened area that is painful and itchy to the dog. You may notice hair loss and a bad odor. A hot spot is always a local lesion whose size may vary. It usually has a circular shape. A hot spot can appear anywhere on the body, but they are often present behind the ears, on the cheek or on the hips. The irritation will cause the dog to scratch, lick and chew at the lesion, worsening the condition. It is not uncommon for the lesion to widen quickly (within a few hours). Providing relief from the irritation and restoring a healthy skin barrier ecosystem are the main goals of supportive care. Consult your veterinarian to identify and treat the problem. Help control the skin condition by using a high-quality shampoo, mousse or micro-emulsion spray to help soothe the irritation and to restore the skin's ecosystem. If an infection is present, you may need an antiseptic formula. Regularly groom and brush your dog and clean skin folds, ears and between the toes. Rinse with fresh water after a swim. Keep your pet free from external parasites by using a high-quality product such as Vectra 3D® to repel and kill fleas, ticks, mosquitoes and other external parasites. Feed your pet a high-quality, balanced diet. Supplement with essential fatty acids, vitamins, and minerals if it is recommended by your veterinarian. Schedule regular check-ups with your veterinarian to monitor your dog's skin condition. Use the scorecard below to monitor your dog's improvements. Download the scorecard here!